Strapped...as in pipe straps. 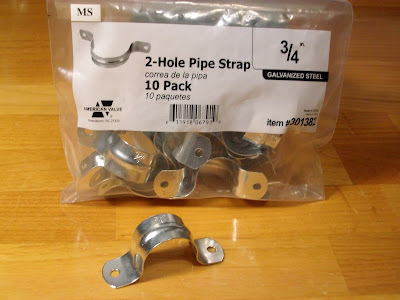 I found these little galvanized beauties at Lowe's, but I'm sure they are in any hardware store in the plumbing section. I love anything galvanized and I have a lot of it in my sewing room as storage containers. So, when I saw these pipe straps I knew what I was going to use them for. Not to mention this bag of 10 was $1.70. That's 17 cents a piece. They do sell them individually and in all different sizes too...heck I can find 17 cents in the bottom of my cup holder in my car. Probably covered in spilled tea and all stuck to the bottom, but it's still 17 cents. 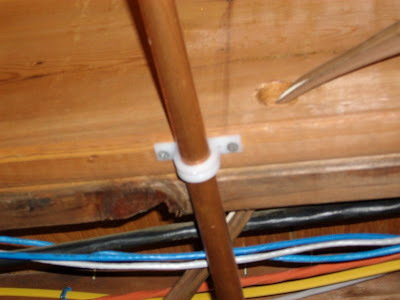 Here's a picture of a pipe in the ceiling of our basement. See that white plastic thing...that's a pipe strap. My galvanized straps are much cuter than the plastic. 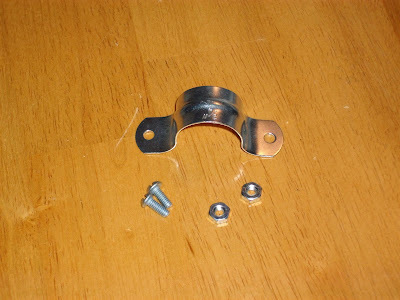 The straps don't come with the screws, so you will need the flat ended type with nuts. 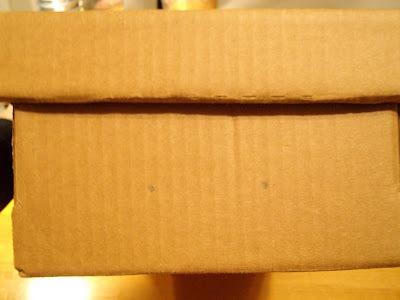 Make sure they are long enough to go through the thickness of your cardboard box, which you'll see in the next picture. Here is a close up of a storage box. Mark the holes of the handle with a pencil where you'd like it to be. With a sharp pokey thing, make little holes in the card board. Sorry this is fuzzy. 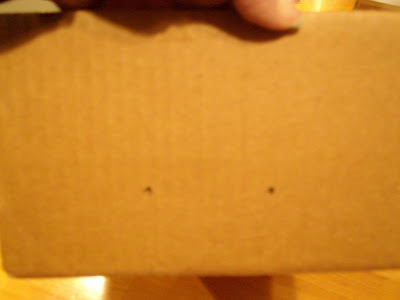 Now just place the screws in each on the holes in the handle, through the cardboard, to the inside of the box. Then just tighten the little nuts on the back. 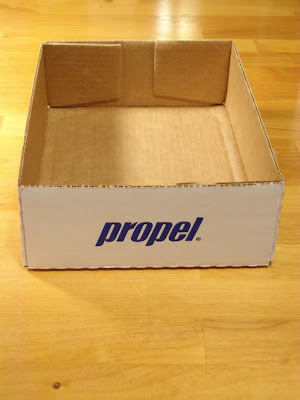 Here you have an ordinary cardboard box with a stylish and cheap handle. This is a little sneak peek at my new sewing room shelf too. Do you remember when I mentioned that the girls drink bottled water by the case. Well, I save those cases and here is one of them. and here it is all dressed up nice and pretty with a shiny new handle. I just covered the box with the fabric that I've picked to decorate the room with. These boxes are great to organize quilt projects, templates, papers, fat quarters, scraps, fabric squares (one box for each size), kids school papers, in and out mail box, bills, coupons, the list is endless. You can label the box too. I am going to use the round metal rimmed key chain tags from Staples, but I had the wrong size. If it works out after I buy the larger size, I'll show you a picture. If you are going to do a lot of boxes that are the same size like I am. It might be a good idea to make a template the same size as the front of your box and then punch the holes in the template. That way, all you have to do is place the template on the box front and mark the holes over and over with out having to measure where the handle is going to go every time. Have a wonderful Tuesday...I know where I'll be seeing you...in the plumbing isle!!! You never disappoint! Love the handles and the boxes. Well done! I love the idea....how fun! I think of you every time I go into a store. I look around and try to see what you would see....as far as finding fun new things to use. I don't come up with much....that is your gift....but I do like thinking about it. This is a recording "You are so clever"! by the way, I am giving away a Ginger Jar Quilt on my blog, if you have a spare minute come by and take a look!! That is so clever, what a good idea! A trip to the hardware store with you would be a blast! Great job, thank you. Yet another great idea...I don't know how you do it! I need a few of these! I will never look at the hardware store the same! where do you think up these ideas!!!! Another good one I must say though. I bet your mind works overtime all the time doesn't it!! How great! Trash to treasure. I was thinking about these exact parts yesterday. Remember when my glass patio table shattered? I was thinking I could use the pipe straps to attach a wooden top to the lonely base that is still sitting on my deck. Cover it with a fun oilcloth and we'd be good to go for next spring! Love your wunderfull ideas!! Thanks for sharing them! Where do you come up with all of these ideas. You are my new favorite blog. I LOVE LOVE LOVE the plumbing aisle! What great stuff can be found there! 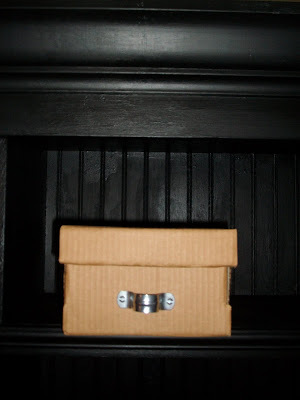 This idea is fabulous...who needs that expensive Martha Stewart stuff anyway when you have a cardboard box and stuff from the plumbing aisle? Karen, You are just amazing! Always coming up with wonderful ideas. As a matter of fact, while I was on quilt retreat this past week, your name and blog came up multiple times. A friend of mine who was on retreat with me also reads your blog. She is a lurker. But she always loves your tool time Tuesday posts. She was giving everyone at the retreat the lowdown on your blog. Your blog address was given out by both of us. I hope you get lots more traffic. Keep up the great work. What a fantastic idea from such an ordinary thing. Love this one! I mentioned your blog on mine, so I hope you will have even more visitors as you deserve it! Girlfriend...you need to write a book with all these ideas. What a great idea.. where did you get the storage box with the lid? A fantastic recycle idea. You rocked this one! Wow! Great idea! The box with a lid...what is that? I can't wait to see your new sewing room! Love that your new sewing space is coming together... does that old phone still work? Any news on a sewing machine? Still thinking of you! You always have great ideas Karen! Man I do like this idea! What do you use for the lid? 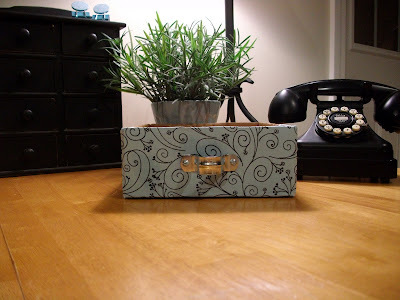 I was just searching last night for some ideas like this to store some stuff in for the sewing room. I want to use your idea to make mine look nice to. I have a black and white roll of wallpaper I want to use and was thinking about using a polka dot wrapping paper if I can find it for a decent price. Thank you again for sharing your ideas! I just found your blog and started exploring. So many great ideas!! These pipe straps as handles have given me the idea to use them as drawer pulls in the kitchen. I want copper, but the pulls are expensive. I'm thinking I could use these, paint with copper paint and, voila!! Thanks for the inspiration! !